Did your site get featured on Groupon.com or LivingSocial.com? Do you need to use one-time use coupon codes? Now you can easily accept coupon codes for Groupon, LivingSocial, and many other systems for your events! Need to Buy a Support License for the Social Coupons Integration? Download the latest version of the Social Coupons integration for Event Espresso 3 from your Event Espresso account. 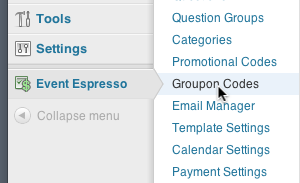 Login to your WP dashboard and go to Event Espresso –> Groupon Codes. This page (Manage Groupon Codes screen) shows all available coupon codes. The Social Coupons integration will allow you to offer your registrants/attendees one-time use coupons for their event registrations. When a coupon code is used it applies to all tickets in the order, so you’ll need to be sure to set the attendee limit to the number of tickets the deal is good for. Begin by going to WP dashboard (WP-admin)) and go to Event Espresso –> Groupon Codes. On the next screen, click on the Add New Groupon Code button. 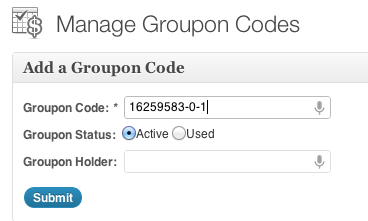 Groupon Code – This is the actual one-time use code that an attendee/registrant will use. 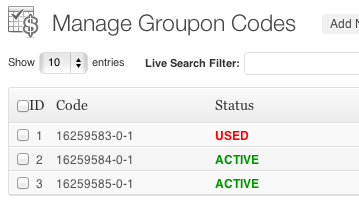 Groupon Status – Set to Active unless you want to create an inactive coupon code. Groupon Holder – Add a description for this code (e.g. spring promotion). Go to Event Espresso –> Events Overview. Now locate your event and click on it. Then scroll down the page and look towards the right side of the screen for the Groupon Options widget. Set the Allow Groupon codes option to Yes and save changes to this event. When a code is redeemed, a 100% discount will apply toward the payment of the event and the registrant will receive a registration confirmation. Need to upload a large amount of social coupon codes at once? Our Voucher Import Tool (Coupon Codes Import Tool) can help you with that. Learn more about the Voucher Import Tool for Event Espresso 3. The coupon code applies a 100% discount. Can that be changed? Each coupon code created by the Social Coupon integration will create a one-time use coupon code that applies a 100% discount to the current balance due for any event registrations. None at this time — check back soon!